73'10" by 52'6" by 15"11"
2 1450 hp (1081 kW) Mitsubishi Ha-101 14-cylinder two-row radial engines, driving constant speed three bladed metal propellers. 5 7.7mm Type 89 Single machine guns in nose, ventral, and two beam positions. 1 7.7mm Type 89 Special machine gun in dorsal position. 1 7.7mm Type 89 Model 2 Te-1 machine gun in tail. The Ib added two guns and a larger bomb bay. The fuel tanks were partially self-sealing. The Ic added a sixth gun and more fuel capacity. The IIb replaced the dorsal greenhouse canopy of earlier versions with a turret containing a 12.7mm Type 1 machine gun. 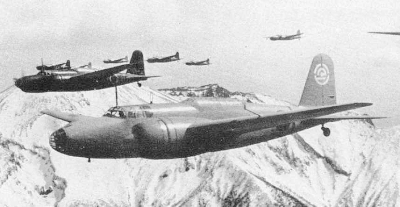 The Ki-21 was the Japanese Army’s principal bomber during the China Incident. It continued in use throughout the Pacific War, with some committed to combat in the Philippines as late as 1944. Like most Japanese bombers, it was lightly constructed and initially had no self-sealing fuel tanks, and it became an easy target for Allied fighters. The design dated back to 1936 and came in response to a Japanese Army request for an aircraft to match the best foreign twin-engine bombers. The Mitsubishi design team, led by Nakata and Ozawa, completed two prototypes in December 1936. The Army could not choose between the Ki-21 and the competing Ki-19 and ordered improved prototypes in June 1937. The improved Ki-21 easily won the competition and went into production in early 1938. "Sally" was a considerably leap forward for Japanese Army aviation, and it was well liked by its crews; but, by 1941, it was already obsolescent. The initial Allied code name for this aircraft was "Jane," but this was quickly changed to "Sally," apparently because MacArthur did not appreciate having a Japanese bomber named after his wife. 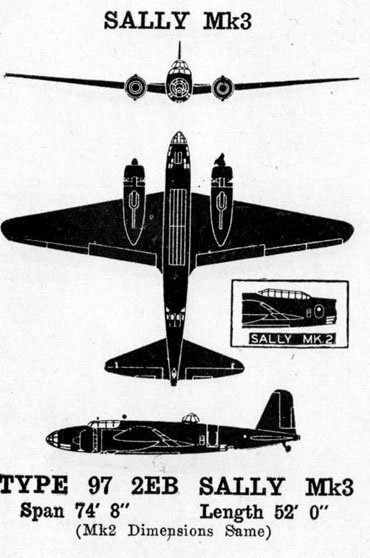 The Ki-IIb variant was named "Gwen" until it was realized that this was simply a new variant of "Sally" with the dorsal greenhouse canopy replaced with a turret. This was an attempt to reduce the vulnerability of "Sally" to modern Allied fighter aircraft. A number of Ki-21-Ias were converted to transports pending delivery of the Ki-57 "Topsy". During the Lae campaign, the Japanese experimented with the use of "Sally" as a PT boat hunter, in an attempt to protect their barge traffic from Rabaul to New Guinea. This proved unsuccessful. "Sally" was also used in special operations, such as the raid on Yontan airfield on Okinawa following its capture by the Americans.